Hello, it is very aggravating that your software displays pop-up ads even when I have paid good money for it. How do I disable ads in PDF Architect 3 and can you also do so in version 4? sorry for the trouble, is it an ad in the bottom right corner of the desktop, or an update message promoting to update to PDF Architect 4 which only displays while running PDF Architect? Tha latter can be disabled by disabling the automatic update check in help->options->general. If there is also a “notification system” entry there, this will disable the desktop ads(this is the place to disable them in version 4). The strange thing about this is to my knowledge the desktop ads were only introduced in PDF Architect 4, could you kindly send a screenshot of any of them to support(at)pdfforge(dot)org? Or did you by chance install the free version of PDF Architect 4 parallel to PDF Architect 3? I have PDF Architect 4 and this just started happening a few weeks ago. I’ve got to tell you that this is infuriating. I didn’t BUY your tool to be spammed on my desktop. Any software that does this without user consent is considered… malware. I have disabled the notifications per your above instructions. If the notifications come back, I will demand a full refund and delete your software from my system. did you double check that no newer version of PDF Archtiect is installed additionally? If there is no newer version installede and no option to disable a notification system, please try if disabling the “PDF Architect Manager” service solves the issue permanently. If this also fails please contact support(at)pdfforge(dot)org for a more direct solution. I too am pretty pissed that my paid for version of PDF Architect 4 is displaying popup ads to me. I shouldn’t have to search for a way to turn them off. How do you turn these annoying ads off or is the best solution to uninstall the software? sorry for the trouble, you can disable the notifications under help->options->general->notification system. And now I still get them? Are you a malware company? Is this some sort of virus attack led be pdfforge? I know, it’s not, you are just incredibly stupid. Now I need to spend time on Google and search for a fellow victim of this that figured out how to get rid of it. The Desktop notifications can get disabled either during an advanced setup or directly from inside the PDF Archtiect options. We are sorry if they bothered you, but they can be disabled with a few clicks. I have created a request to disable the notifications in PDF Architect 3 all together, as there is no easy way to disable them there as user. Paid users shouldn’t get any ads, but our team will check if there might be potential issues when more than 1 version of PDF Architect is installed on the same machine (e.g. a free copy of PDF Architect 4 and a fully activated PDF Architect 5 Pro). I’m equally angry that after I paid for full Pro version of PDFArchitect 4 I started getting spammed with ads all of a sudden. I have tried disabling notifications in the options but IT MADE NO DIFFERENCE. if there are more than 1 PDF Architect versions installed on the same system and one of them is freeware. Please check if you also have PDF Architect 5 or PDF Architect 3, where the notification system might still be active. The latest PDF Architect 5 update should fix this by checking for other versions and only using 1 notification system for all versions. I have only ever had PDFArchitect 4 on my system. I might have used it in trial mode initially before paying for the full version. So please fix the bug in version 4.
if we can can’t quickly find a solution to this, we will give you a free update to PDF Architect 5. So far all tests indicate it only happens when there are multiple versions installed. The notifications get dispayed by a service called “PDF Architect Manager”, please run services.msc and disable any PDF Architect Manager services. Since PDF Architect gets installed together with PDFCreator by default, did you check there is really no other version of it on the system, even if you didn’t actively install one? Did your license key get exchanged by our support at any point of time? I, too, have been getting the pop-ups for some time. I uninstalled the pdf architect program some time ago. I don’t even remember which version it was…but I am still getting the pop up. It is very annoying. And feels creepy. This same problem just started happening in my desktop. 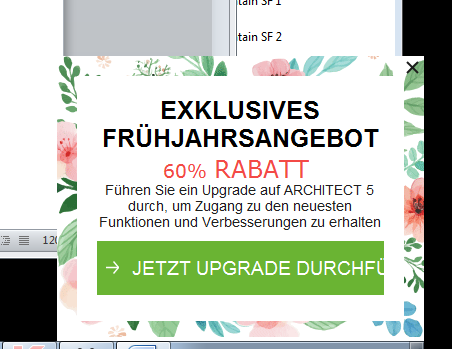 The popup is in German, so I had to get it translated to understand that it is coming from PDF Architect. We use many PDF software packages. I have four different ones on this computer. If the message is not clear from the other users, we will remove PDF Architect from all of our desktops and not install any of your products again if this behavior is not stopped. The popup is advertising version 5. I have version 4 installed. The popup shows in the lower right corner of the screen, and is not connected with having PDF Architect 4 open. Whoever came up with this as an acceptable way to promote the product should be moved to some department where they won’t hurt your business. This was a VERY BAD IDEA. Thanks for your understanding. Is there any updated information as to how to not have this happen on my desktop? if you use PDFCreator and update it regularly, you might have multiple versions of PDF Architect on your system. Please check if there are still any versions of PDF Architect installed. thank you for the feedback and sorry for the trouble. Please check if there might be multiple versions of PDF Architect installed on your system. So far, it looks like this is the cause of still receiving ads after turning off the notification system inside PDF Architect. Are you sure it is a PDF Archtiect ad which is still being displayed? As far as I know, all the ads have PDF Architect in the the title/text, so if it was in German and didn’t contain the phrase PDF Architect it is probably not our ad (if you see it again, please take a screenshot and I will happily check). It will be pretty embarrassing if it's not PDF Architect. I used Google translate. I was probably more upset than I should have been, because I was fighting with an antivirus problem at the same time. Thanks for being so polite and helpful. I believe I removed two products - probably PDF Architect 4 and PDF Creator - but I'm sorry, I'm not sure. Again, I was fighting with an antivirus from a remote computer at that same time, and not paying as much attention to this as I should have. from everything you have written, I believe neither your OS nor PDF Architect was set to German? It is totally understandable it is upsetting to see ads on your desktop (in a foreign language) after having followed the instructions on how to disable them, we are really sorry about this and it isn’t happening intentionally.